The Rebel Sweetheart. : Sneak Peek | Thank You, Laneige Collection. How's 2018 treating you so far? I hope the first two days of the year have been good to all of you! 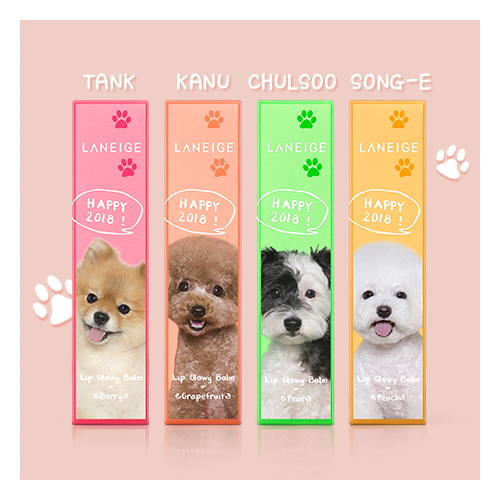 As we usher in the Year of the Dog, Korean cosmetics brand Laneige recently launched a special collection of lip products to welcome the New Year. 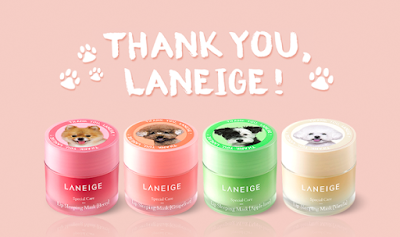 This limited edition line is a collaboration with Thank You Studios, a studio in South Korea that specializes in pet photography, and is aptly named as 'Thank You, Laneige'. Featured in this collection are the Lip Glowy Balm and the cult-favorite Lip Sleeping Mask in a new and adorable packaging. Thank You Laneige Lip Glowy Balm, 10000 won each. Thank You Laneige Lip Sleeping Mask, 18000 won each. 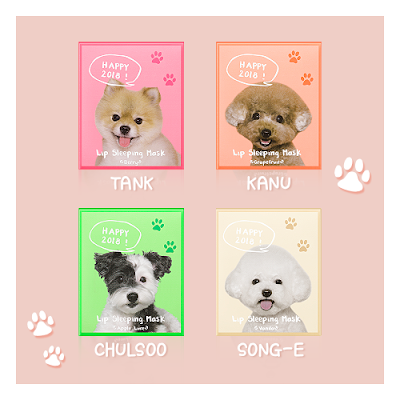 Photos of Thank You Studios' models, Tank (Pomeranian), Kanu (Poodle), Chulsoo (Terrier), and Song-E (Bichon Frise) are printed on the boxes of each Thank You, Laneige product. Their cute faces can also be seen on the caps of each Lip Sleeping Mask, and on each tube of the Lip Glowy Balm. Thank You, Laneige Lip Glowy Balm box. Thank You, Laneige Lip Sleeping Mask box. The Thank You, Laneige line is now available at Laneige stores in Korea, and at the Amore Pacific online store. Aww what cute and funky coloured packaging! These are so adorable, I would buy them for the packaging alone, especially Tank. So cute! A dog lovers dream for sure. what a great idea. I had no idea it was the year of the dog! I love the colorful and cute dog faces on this packaging! Oh! I didn't realize that this year is the year of the dog! Good to know! Such cute little product. I will have to try to find this product out. Such a cute packaging of these Korean lip product. Laneige have a great idea for this year of the dog and I really love it. Super cute, super, bright and super eye appealing. This is a product I could see not only catching my eye but the eyes of my children as well. Looks like a wonderful product. The dogs are a great touch. So cute!